Diplomats Owe NYC $17.2M For Parking Tickets; DC Is Owed $340,000 : The Two-Way Some of the tickets go back as far as 1970. Diplomatic immunity makes it hard to collect. 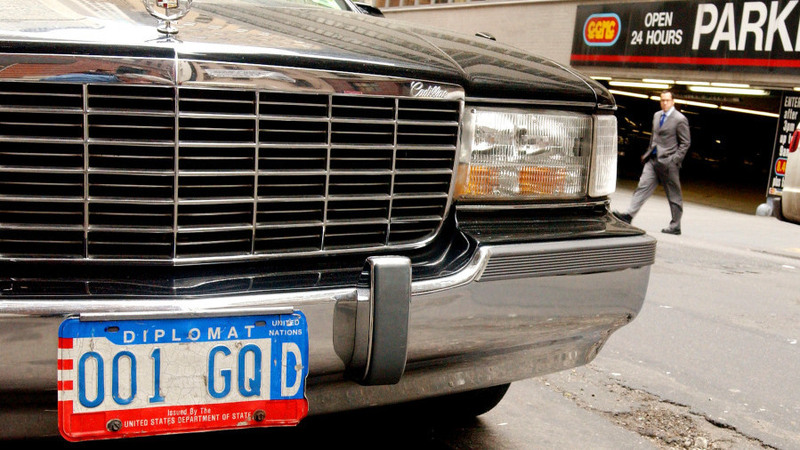 A car with diplomat license plates near the United Nations in New York City. There was outrage yesterday over the $16 muffins and $32 snack packs purchased by the Justice Department in recent years. Diplomats owe the city of New York $17.2 million and owe Washington, D.C., more than $340,000 for unpaid parking tickets, Washington's WTOP-radio reports. According to WTOP, Russia is D.C.'s worst offender. Its diplomats have 892 outstanding tickets and owe the city $27,200. But not even the Vatican is completely clean. "The Holy See is at the bottom with one outstanding $25 ticket for an expired meter," WTOP says. Some of the citations go back to 1970. While diplomatic immunity seems to be preventing the jurisdictions from collecting, they do have some ways of getting back at the scofflaws. "According to a spokesperson for the District's Department of Public Works, the city does boot diplomatic cars with overdue tickets, and tows embassy vehicles parked in rush-hour zones," WTOP adds.